Tebowing: Is praying in public over the top? If you’re an NFL fan, like I am, you’ve probably been amazed by the turnaround of the Denver Broncos season since their evangelical Quarterback, Tim Tebow began starting for them. Watching him for most of a football game is painful. He misses passes constantly, hardly converts on 3rd downs, and overthrows his wide-receivers. On paper his statistics from a passing perspective look awful. Yet, somehow he keeps pulling wins out by some miracle in every game. Some people like it, and some people are highly annoyed by it. When we look in the scriptures, we see some examples of people being condemned for praying in public such as when Jesus tells us to pray in our closets rather than making it a big scene in public, but also many instances where people prayed in public such as Daniel in the Bible and Nephi in the Book of Mormon. So where do you stand on the issue? Do you feel it’s over the top to pray in public (i.e. “Tebowing“) or do you feel it’s o.k.? There is nothing wrong with praying anytime, anywhere. What makes me uncomfortable is making a big show of it. In Matthew 6 we are taught how to conduct our praying, fasting, and almsgiving: quietly, not drawing attention to ourselves less the glory which should go to God is given to us. Ostentatious worship is condemned as being the pattern of the pharisees – they have their reward. One particular activity of the pharisees that our Lord found offensive: they would make broad their philactories. These were boxes worn on the forehead which contained scriptures from the Torah. In essence, the pharisees would wear extra large scriptures on their faces for the world to see, not unlike writing bible verses on your face that a camera could pick up in a football game broadcast on national TV. Thanks for the comment. I can see your point and you make a very good argument on why one shouldn’t show off or flaunt prayer. I’ll play devils advocate here for a minute. Some would say that praying in public is like being a missionary and spreading the gospel. What do you say to those who say that? This is hardly anything new! I’ve seen many players do similiar things over the years-Tebow is so outspoken about his Christian faith (and his pro-life convictions) that it’s generated more interest. In Jesus’ day public prayer was looked on as a righteous act-and Jesus is warning against doing it in public to gain men’s praise. That is not the case now-to be public in your Christian faith will get you in trouble. Football is nothing but a game. Period. It doesn’t bother me in the least. Not to be judgmental, but I think that Time Tebow does it because that is the way that he is. i.e. sincerely thanking God. It is hardly to show off, as he is probably getting more flak than praise for it. In the end, I am content to let God judge the intent of his heart. You’re very right in that we aren’t the judges of why one prays in public. Just to play a little devil’s advocate though. There are some who would say that although Tebow is sincere, he is damaging the “face” of the gospel by flaunting it after every play and touchdown. It is great to be thankful to God, but to stop a football game to drop to a knee and utter a prayer seems like flaunting it rather than quietly thanking God in a more personal setting. What is your response to those who say that about praying in public? I believe that it’s not what we think, but its about what the word of God SAYS. 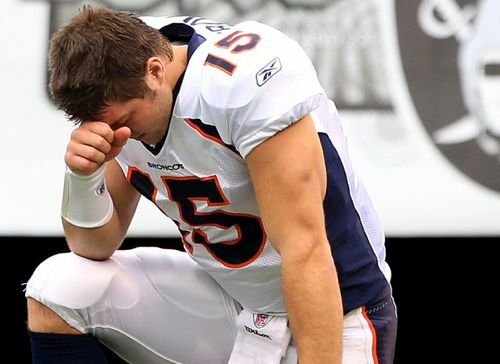 If Lord Jesus was against the Pharisees and Saducees for praying in public, then what makes Tim Tebow different? And also, how come I don’t see a lot of his fans and people changing their ways and coming to Christ (nor would I honestly know either, forgive me if I’m judging) but I do see a lot of people seeing it as a folly (calling it “Tebowing” and putting it on videos, and t-shirts, mocking him, calling him the “Mile high messiah” etc.) I thought we’re supposed to be a light unto the world?